Over 300 million bottles of champagne and many more million bottles of sparkling wine are drunk every year. That’s an awful lot of bubbly – and even more bubbles! According to one scientific study there are around 250 million bubbles per bottle. But what puts the bubble in the sparkling wine? And what makes sparkling wine champagne? A better-documented but less romantic story is that a paper discussing the possibility of making sparkling wine was published by the Royal Society many years before Dom Perignon’s adventure. 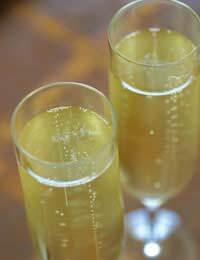 Only sparkling wine made in the Champagne area of France, to the east of Paris, can legally be called champagne. Made anywhere else, even by the same method, and it has to be called sparkling wine. The climate in north-east France, with severe winters and very little sunshine, is not what most people would associate with wine-producing but grapes of high quality are grown there. There are three varieties of grapes used in the making of champagne: Chardonnay (white), Pinot Noir and Pinot Meunier (both black). The grapes are hand-picked when ripe and vinified to produce still white wine. Then the process of turning wine into champagne begins. We’re going to describe how champagne is made but the method is equally applicable to most quality sparkling wines. A time-efficient method has been invented for making sparkling wine but the best ones are still made using Methode Champenoise. The chef de caves (master champagne maker) and his team blend still wines from different grapes and years as the base for champagne that will have the distinctive characteristics of the house. If the harvest has been particularly good, the chef de caves may make a vintage champagne solely from that year’s grapes. To the bottled wine, a liqueur de tirage is added. This consists of sugar and yeast that will ferment in the bottle, producing the famed bubbles. The bottles, which have to be strong to withstand the pressure, are sealed with a bidule (a widget or thingummy) and crown cap, and stored for months in cellars dug out of the chalky soil of the region. During this time a deposit called lees made up of dead yeast cells will form in the bottle and it’s this sediment that helps give champagne its rich flavour and taste. After ageing, the bottles have to be riddled. Each day the bottle is turned about 45 degrees, at the same time as being gradually pivoted downwards so it ends up upside-down. This is to allow all the lees to settle in the neck of the bottle. In the old days this was done by hand but now is more usually done by machine. Similarly in the past disgorging was also done by hand, a sharp wrist movement removing both the stopper and the sediment in one go. Today the bottle is dipped in a liquid at -25 degrees, freezing the sediment to the stopper, so that both can be easily removed. A liqueur de dosage, usually made of sugar and some sweet wine, or old champagne is added. The exact composition of the liqueur de dosage is decided by the chef de caves, and will contribute to the distinctive house flavour. The amount of sugar added at the final stage determines the sweetness of the champagne or sparkling wine that ranges from Extra Brut to Demi-Sec. The champagne bottle is sealed with a cork, a metal cap (to prevent the wire cutting into the cork) and a wire restraining muzzle! The smaller the bubbles in the champagne the better to release the flavour and aroma. For more of a fizz, before filling with champagne or sparkling wine, wipe your glass vigorously with a towel. This leaves tiny fibres on the glass that stimulate bubble release.